I've always enjoyed listening to Eric Clapton over the years and have been so impressed with his overall mastery on the guitar. 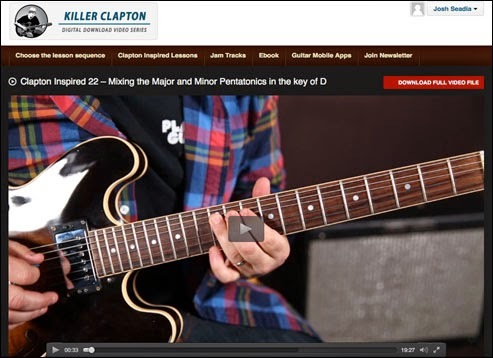 So, it was fun to hear that one of my favorite guitar teachers, Marty Schwartz, released a new guitar video series called Killer Clapton, breaking down many of the popular riffs and embellishments from Clapton's tunes. Since I am a member of Marty's Guitar Coaching Club, I automatically received access to this program and I'm happy to review this new online series with you today. I've played acoustic guitar for many years, but have always been intimidated by the electric guitar. Fortunately, I was given an Fender guitar as gift a long time ago, but I must admit that I've used it so infrequently. Therefore, I wasn't sure if I'd be able to apply my knowledge on the acoustic with the electric for this series. However, once I plugged my electric in and tuned it up, within a couple of lessons, I was pleasantly surprised to find that I could actually follow along with Marty. And now that I've finished the series, I'm eager to explore more electric guitar lessons. It was fun to learn new techniques on my electric guitar and Marty shows you some cool concepts such as the BB box, slides, double stops, bending strings, hammer-on's and pull-off's, half-bends, pre-bends. The examples shown can be used in different keys, so I found lots of great ideas to incorporate into my guitar playing. In some modules, Marty also shows how to play the same lick on other parts of the guitar neck, which is helpful for developing a better understanding of the fretboard. In addition to the major and minor pentatonic scales, Marty teaches you extra notes that to add which are used in various Clapton songs. There are also jam tracks where you can practice these different licks in various keys. I was surprised to even find a cool "country" style sound in this series on the 9th fret of the g string using a bend, while simultaneously holding the 10th fret on the b string. There are 22 individual modules, with over 3 hours of Clapton guitar instruction! I love that you can pause, rewind and play each lesson as many times as needed to help you master the material. Marty is a gifted teacher (as evidenced by his millions of fans and tons of free lessons on his YouTube channel) and really takes these seemingly complex exercises and breaks them down into manageable pieces, repeating them often and using each piece as a building block to the next part of a riff. What's great about the Killer Clapton online series is the ability to download these files directly to your computer. In the past I received DVD's in the mail for being a Guitar Coaching Club member, but now Marty has transitioned to online delivery. So, it's cool to view it on the web as well as download lessons and have them available offline too. Plus you can access the course from anywhere you have an internet connection. If you're a fan of Eric Clapton's music, have access to an electric guitar, and want to increase your knowledge and skills on the fretboard, then check out Marty's Killer Clapton Series! Marty makes it fun to learn and if you keep at it, you'll be jamming in no time! Have you purchased Marty's Killer Clapton series? What's your feedback on this course or others from GuitarJamz? Please share your comments below with our readers! Marty also offers the below programs as either Value Bundle sets or as individual DVD's and CD's. Overall, Marty is a solid player and I can't speak highly enough about his teaching style. So, I encourage you to go grab your guitar and experience Marty for yourself!